Electric Chafing Dish Heater Fits Virtually Any Full Sized Chafing Dish! Fit Virtually Any Full Sized Chafing Dish! The slim stainless steel profile and patented magnetic design allow our heater to fit most any full size chafing dish. 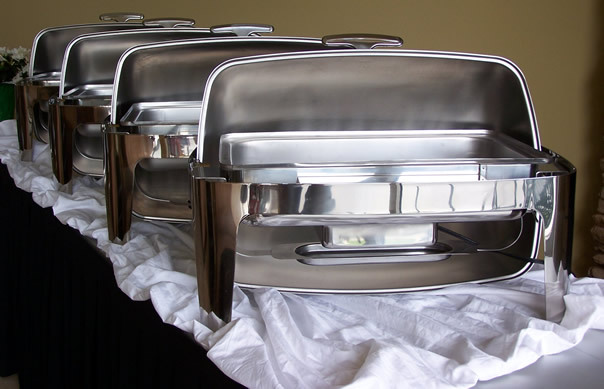 From standard economy chafing dishes to the high end roll-top, the Buffet Burner will quickly and easily attach to your existing chafing dishes going virtually unnoticed. Up to four Buffet Burners™will run on ONE 20 amp outlet! View our instructions page for more information on how to use the Buffet Burner. Buffet Burners™ will also accommodate steam tables, hot dog carts, warming boxes, and more.